For some two thousand years, generation after generation of Christians have waited for the return of Christ. These generations have faithfully studied the Scriptures, noted the way-marks outlined in prophecy, and watched for the return of Christ – just as He instructed (Mark 13:32-37). Many among these generations have lived in the expectation that they would see Him return, based on the moral decline of people all over the earth and based on an expectation that “time just can’t go on much longer”. Some among the current generation also expect to see Christ come, but not all have the same reason for this expectation as our ancestors. Among those who are watching and paying close attention are Christians who give some fairly radical reasons for expecting Christ to come soon – among which is the fact that ours is the first generation to be able to chart and graph the fulfillment of prophecy. Think about that for a moment. We know that the signs of Christ’s coming will occur with increasing frequency in the last days, and currently our ability to see prophecy being fulfilled is not only coming to pass, but we have the ability to anticipate and track its fulfillment in real time. That, my friends, is a big deal that should give sobering pause to all Christians. It is also a big enough deal that careful, cautious Christians will challenge the assertion that the fulfillment of prophecy can be charted and graphed. They will ask for proof supported by scripture. Fair enough – that is exactly what they should do. That being the case lets look at the situation in some detail and lets go to scripture. This article and this blog build on my book Planet In Distress. In my book, I trace the arc of cause and effect from original sin to the present degraded and decaying condition of the earth. Essentially, I demonstrate that sin results in death – including the death of the massive and perfectly balanced systems that God created to sustain life on this earth, such as our oceanic, atmospheric, fresh water, climate,and food production (soil) systems. In my book, I show a cause-and-effect process that leads from sin to the degradation of our environmental systems, and then show how instability in our environmental systems causes instability in our global complex society. Finally, I demonstrate how destabilization in our global complex society leads to conflict on many levels and to disease and pestilence and increased natural disasters – all of which fulfill the prophecy given by Christ Himself when he described the signs that indicated the last days of the earth in Matthew 24:6-8. With that context in mind, lets turn to scripture. We are told in Romans 6:23 that “the wages of sin are death”. That is to say that sin causes death. Staying in Romans, we are told that “the whole creation groans and labors with birth pangs” (Romans 8:22). It is because of sin all of creation groans and this same creation will be delivered from corruption. How do we know the earth will be delivered? Read Romans 8:21. Is there more evidence that the earth itself is subject to the effects of sin and that it will be redeemed? You bet. Consider the most memorized verse in all of Christiandom – the verse that everyone knows but that no one thinks about: “For God so loved the….” (John 3:16). God loved the world that He created and He loved man, whom He created in His image. But not all of Gods acts are acts of love. God is angry that His earth was destroyed by sin and that every person who ever lived has suffered. We know that the time of God’s wrath will come and we are told by John in Revelation 11:18 that He will “destroy those who destroy the earth”. In Revelation 21 & 22 John also tells us that the earth will be re-created in perfection and glory. For a greater perspective on this it is benefical to read Isaiah 11. In my book I have more to say about scriptural evidence as well as the specific systems that God created during creation week, and I also discuss effect on the earth of the three curses that God placed (the curse of Adam, the curse of Cain, and the curse that was the flood). However, the above scriptural foundation should suffice for the purposes of this post. With that done, lets move to the actual substance of this post – my assertion that we can chart and graph the fulfillment of prophecy. Again, lets look at the chain of events as outlined above – sin affects and destabilizes the earth’s environmental system (and, like a spinning top that is slowing, they are becoming dramatically more unstable in these final days) and the destabilized environmental systems in turn destabilize our global comlex society which causes conflict and disease and pestilence, etc. To see this play out in real life we need look no further than Syria (or Haiti or Mali). As anyone who is paying attention knows, Syria has been engaged in a terrible rebellion/civil war for the past couple years. Numbers for deaths (over 70,000) and refugees (approaching 1 million) from this war are apalling and both are considered to be low-balled. In Syria, conflicts have come in layers, with war between groups (government versus rebels), war between outside groups and Syrians (Hezbollah fighters and Iranian irregulars brought in to Syria to fight against rebels), as well as between the Syrian government and other governments (cross-border skirmishes with Turkey and Israel). There has been fighting between religious groups (Alawite Christians who are allied with Assad) against rebels and perhaps also against the radical Muslims Assad is bringing in to try and save himself from the Muslims. In addition, Lebenon has seen a dramatic spike in violence as conflict among groups such as Hezbollah and Syrian refugees spreads to its territory. But even that is not the end, for there is the potential for futher (and massive) violence. The US has warned that if Syria uses chemical weapons on the rebels then it, the US, will have no choice but to intervene. That was not the exact wording of the warning, but it was the gist of it. So, in the above brief description of the killing and chaos that prevails in Syria, we have wars and rumours of wars, we have nations rising against nations (covertly or overtly) and kingdoms against kingdoms 9people group against people group). And, though I have not covered it yet, we have famine and pestilence. In short, Syria is, on a very small scale, fulfilling the prophecy that Christ gave. We will see this prohecy much more completely fulfilled as more and more nations go the way of Syria, but this does nothing to diminish the fact that we are seeing prophecy fulfilled before our eyes. The important question here, though, is “what triggered these events in Syria?” The answer will surprise you and will likely open your eyes to the waves of prophetic fulfillment that we can expect to see elsewhere in the world in the very near future. Syria had an oppressive and despotic government, no doubt about that. And, that government was composed mostlyof a minority Christian sect that was governing a majority of mostly Muslims. There were many things that could have gone wrong in the country. But what actually when wrong is that beginning in 2006 the country found itself experiencing a drought of historic proportions. In fact, in the words of one expert the drought was “the worst long-term drought and most severe set of crop failures since agricultural civilizations began in the Fertile Crescent many millennia ago.” The drought was felt around the Middle east and Mediterranian region, but it was particularly harsh in Syria, where herders lost up to 85% of their herds because there was nothing for them to feed on. Some 75% of farmers suffered total crop failure – and not just for one year but year after year. Hunger and desparation ensued and served to trigger the rebellion not just in Syria, but in the entire region through the “Arab Spring” movement. That is right – it was food shortages and food price spikes that triggered the Arab Spring, and those food shortages stemmed from a climate shift that produced a historically singular drought in the area. The conflicts in turn produced refugees and further hunger and disease, and also produced pestilence – more on this last point later in this article. Much has been written on this topic, but here is a link to one of the earliest and best articles. I highly recommend reading it because it lays the groundwork for understanding the phenomenon more fully. The Middle East drought and food price spike did not occur in a vacuum, but occurred at a time when food prices were spiking on a global basis (and simultaneously, so were food price riots and conflicts and rebellions). Below is the long-term food price chart produced by the UN’s Food and Agricultural Organization (FAO). Note that food prices were quite stable for a very long period of time and then they became unstable and spiked three separate times in a period of just a few years. An organization that has done cutting-edge work on the relationship between resource scarcity and societal instability is the New England Complex Systems Institute or NECSI, which is an academic research organization based in Boston. NECSI has done some fantastic work on several topics and you might want to look at their website. But of immediate interest is their work on analyzing food price trends and social unrest. Take a look a the graph below, which NECSI produced to illustrate the fact that civil unrest and uprisings take place in many countries during food price spikes. Note that the red vertical lines in the graph above are indicative of uprisings or rebellions or wide riots while the numbers in parenthesis are deaths related to the event. Obviously, the numbers in regard to Syria have clibmed significantly since this graph was made in late 2011. But here is the thing: NECSI continues to call for yet another food price spike and indicates the magnitude of the problem by pointing out the trend line in the graph below. Note that NECSI sees significant relationships between food price spikes/trends and food being used for fuel – I cover this in my book. If we stay more or less on the indicated trend line, then the progressive destabilization of society is assured, with weak societies being hit first and hit hard. With that in mind, let us look at two questions – will the next round of food price spikes come and, if so, what countries (or region) will be most affected? For the first question, we need to take a look at global food production since the abundance of food available will determine the likelihood of food price spikes. The first indicator we will look at is the level of strategic grain reserves on a global basis (yes, governments keep strategic grain reserves just like they keep strategic oil reserves, strategic gold reserves, etc.). 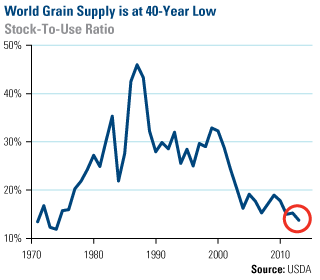 As you can see from the graph below, the level of strategic grain reserves globally has been steadily eroding for many years, as measured by the stocks-to-use ratio. 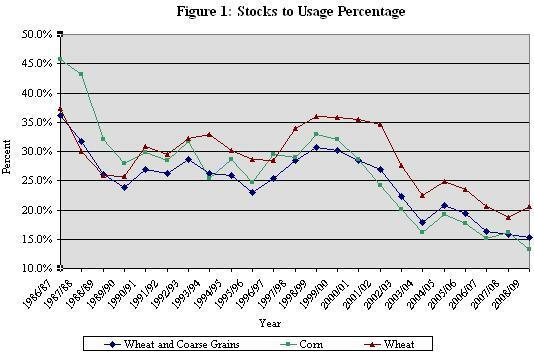 The fact that this is a huge problem can be indicated by the following graph whihc shows the amount of land harvest used to feed the world on a per-person basis while the third graph gives a historical perspetive on world grain stocks-to-use ratios. Mind you, this second graph can be misleading because it makes it look like we are all eating on less and less land every year, which is true since our population is continuously growing. What it does not show is that our productivity for a given peice of land has steadily increased over the period, though that rate of increase is slowing. The real question is, what do we do when droughts, such as we see all over the world, and floods, such as we saw in the UK and westenr Europe last year, suppress agricultural production in an environment of razor-thin reserves and growing population? Simple. We get another food price spike. The whoel world gets tht food price spike and that includes 3.5 billion people who make less than $2.50 per day and who are already spending 50-90% of their daily income on food. They have no cushion, thye have no buffer, they have no “Plan B” and their only option is to starve. However, they will not go quietly. They will instead rebel against the obvious inequality of the situation, bringing about wars, rumors of wars, disease, and pestilence. There is no doubt that the next round of food price spikes will come. Lets turn to the second question we asked above: Where will societal destabilization (and conflict) happen next? Well, no one knows for sure, but if we are to indicate a region and not just one country, all apparent signs point central Africa. Take a look at the graph below. 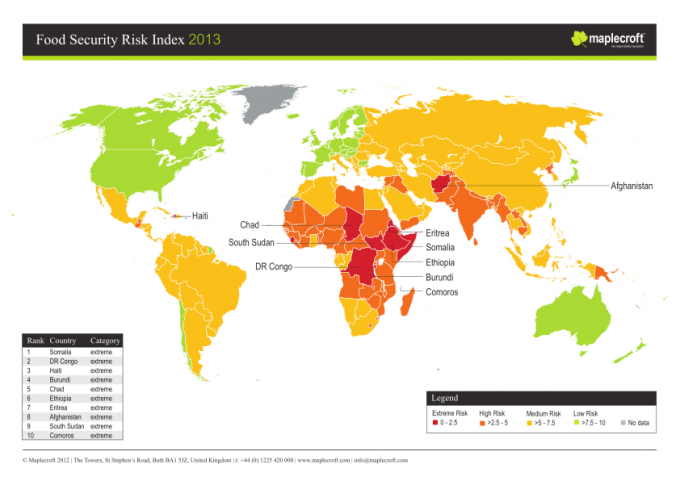 It is a food security map produced by the Maplecroft company, a security outfit headquartered in the UK. 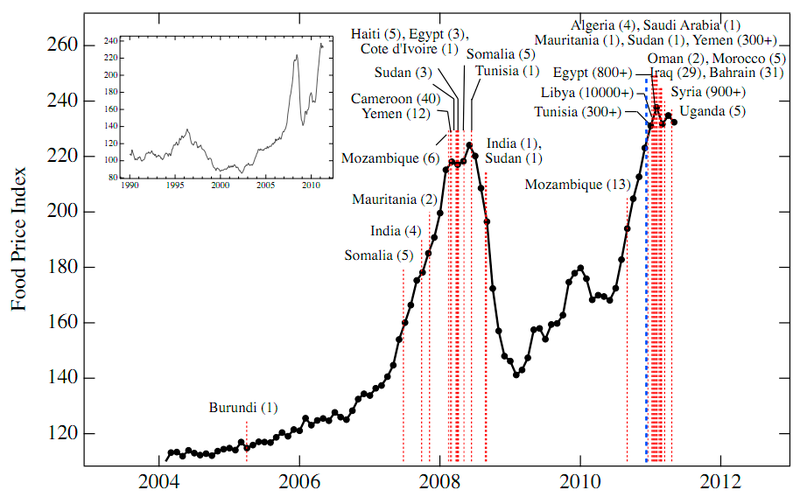 By looking at the level of food insecurity indicated (and by lookng at things not indicated, such as water insecurity, income levels, government stability and inflitration of islamic extremists), it can be confidently asserted that central Africa is at risk of societal destabilization from coming food price spikes. Watch FAO food price indicators and news from Africa this year and see if this expectation comes true. However, don’t watch your own food price bill. In countries such as the US, only a small fraction of your food bill actually comes from “food” – the corn in your $4 box of corn flakes only accounts for about $.10 of the total cost and the rest is made up of handling, packaging, marketing, profit, etc. What really matters is the price of corn or wheat or rice as a commodity, and to track those you might consider watching this graph or, perhaps, simply watching the drought proceed in the midwestern US by keeping en eye on this website. I do not mean to imply that Biblical end-time prohecy is driven by droughts. Far from it. To be clear, what I am saying is that sin profoundly affects and degrades the natural, physical world an that all of the natural world is in a pattern of dramatically accelerating decay. This includes our food production system, yes, but also includes our fresh water system, our oceanic system, our climate and atmospheric systems, and others. It is the simultaneous and accerating decline of these systems that put more and more pressure on our global complex society which produces the pressures and conflicts which ultimately fulfill prophecy in these last days. But of course, prophecy did not just deal with societal effects – it also dealt with natural disasters, so lets turn to those. The same sin-induced process that is driving the decay and decline of our phyiscal world is also driving an increase in natural disasters. Take a look at the graph below. It must be viewed cautiously since it tracks REPORTED disasters going back to 1900. There is an extremely good chance that disasters were happening in remote places of the world in 1900 that were not reported and therefore did not make it into any data base. But can the same thing be said for 1960? 1970? 1980? 1990? 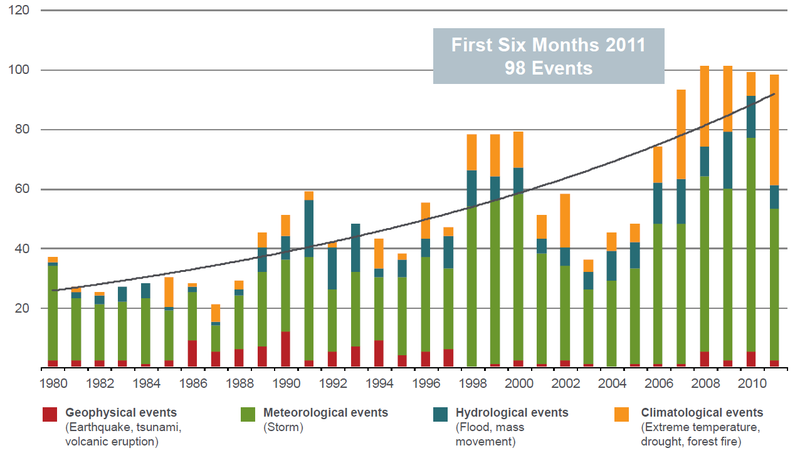 Look at the increase in disasters since 1990 alone. This is not rate of increase due to just improved reporting alone. 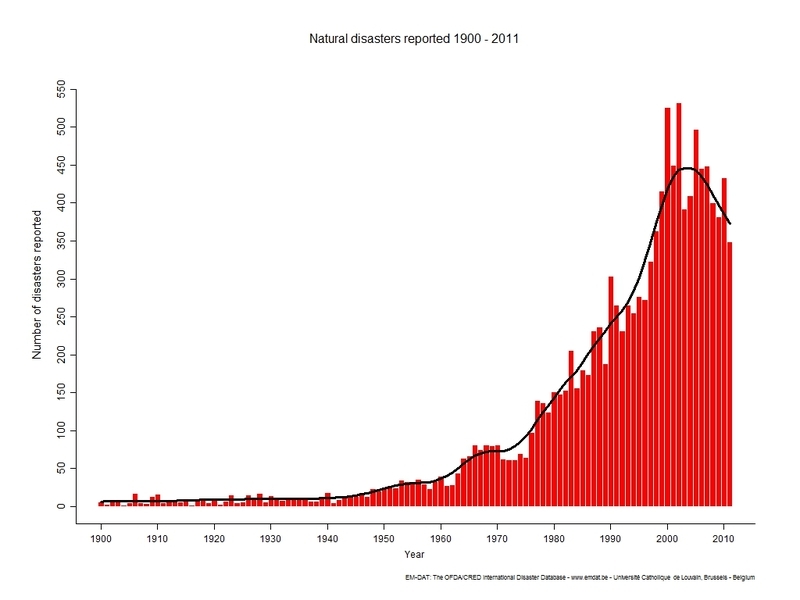 The second graph shows the trendline reflected in US disasters. There is no debating whether or not we are seeing an increase based on improved reporting in the US. Our reporting of disasters has been excellent for well over 100 years. Unfortunately, neither chart shows 2012 and we will be waiting another couple months for such updated charts to show up. The trend-line for disasters in the US looks as inexorable as the trend-line for food prices. I have only touched on the forces that are driving our fragile global complex society to conflict and disaster in fulfillment of prophecy. For a full explanation, see my book. Or, for a broader view of how the sin-to-disruption-to-fulfillment-of-prophecy process works, look at this earlier post on my blog. But even with the scant overview provided here, it should be evident that ours is the first generation to be able to chart and graph the fulfillment of prophecy, if we will but look discerningly. We can see population growth combined with land degradation and we can see subsequent pressure on food supplies that, combined with adverse effects from climate shifts, mean looming food price spikes that result in conflict and famines. We can chart and graph the decay in food supplies. We can chart and graph the flooding and the unprecedented droughts. 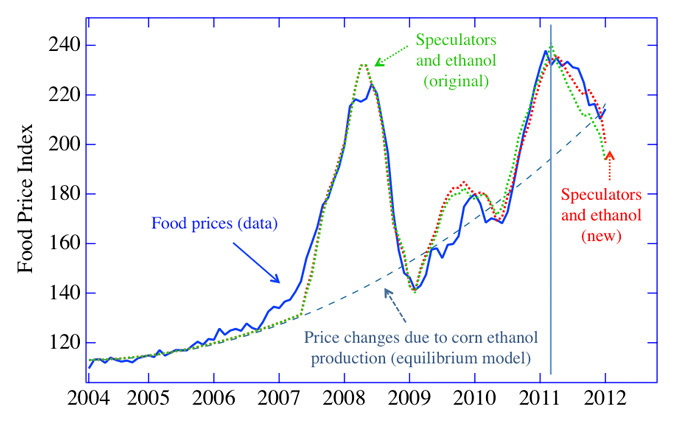 We can see the trends in food prices and conflicts and we can even predict where societal instability will occur next. Why is it, then, that the Chritian world is not awakening to this real-time fulfillment of prophecy? Are they asleep as Jesus said they would be in Matthew 25:1-13? The amazing thing that Jesus was trying to say in this text was that we should watch for signs of His coming. This is significant in that Matthew 25 is a continuation of the discourse that that Christ started in Matthew 24, where He gave the signs of his coming and again told his followers to watch (that instruction is actually recorded best by Mark in Chapter 13:32-37). Therefore, it is the duty of Christians to be prayerfully watching and discerning the signs. Inthat context, previous generations simply have not had as much to watch as we have now, and yet Christiandom is asleep to the signs – just as Christ said we would be. It truly is time to awake and to serve our Lord to our fullest ability. It truly is time to realize that we are alive at an amazing time in history – we are seeing the fulfillment of prophecy, something that generations before us have yearned for. We live in amazing, exciting, challenging times where every day is rich with opportunities to serve our Lord. How can we be asleep? thank you thank you thank you. saw Scott on c-span and what a time we are living.